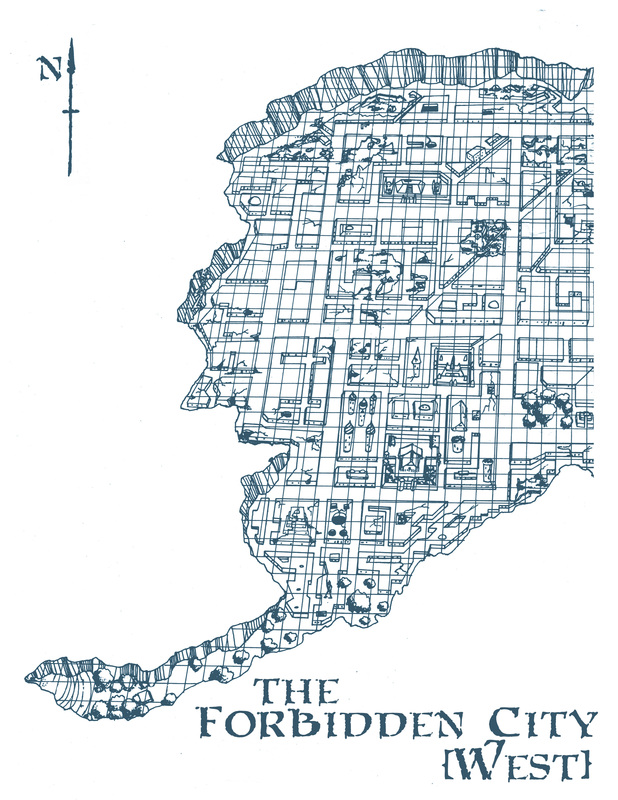 This isn’t my work, but there are times when you want to be able to present something like the main map from Dwellers in the Forbidden City (from the vantage point that they get at the edge of the cliffs looking down over the city) without including all the DM-side information to them that’s contained on said map. 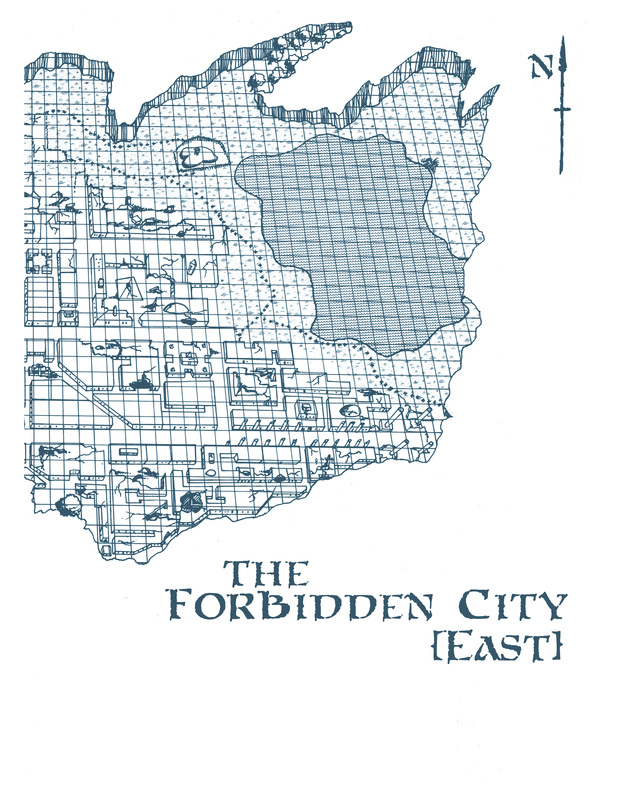 So last night I scanned the Forbidden City map and did a bit of clean up work to get these maps. This first one is the classic one from the module, with all the DM notes removed. It is designed to print on a sheet of ledger-sized paper. But of course, I don’t have a ledger-sized printer. So I also broke it up into these two US letter-sized maps for easy printing (I also printed them on blue faux-parchment). I remember getting this module as a kid, one of the few I had actually. At the time it just confused me a great deal with it’s sandboxy exuberance. Now I think it’s one of the better from that era. Fantastic……….I loved this module when it came out and plan to use it later in my campaign Thanks for posting this little tidbit!! 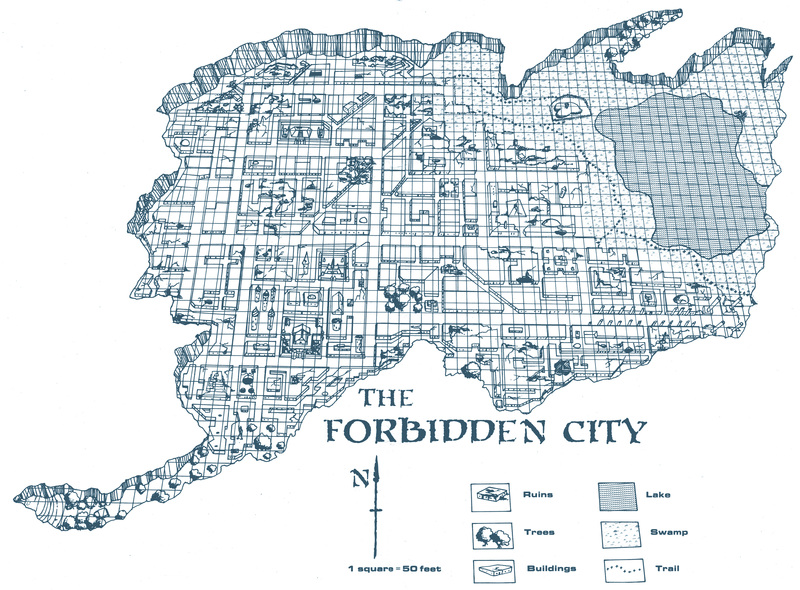 If you’re running Dwellers in the Forbidden City, you definitely need to download this player’s map of the valley. I love this adventure, but my players never made it past the wasps last time. I love that adventure! Thanks for sharing that map. I love the map. Dwellers was one of the first serious adventures that my primary gaming group did when we first got together. I think I lost a character in this one, too. Ah! Memories of ’81! Nice. You made me go buy the module from my Drivethru wish list. FWIW, I was amazed to find how cheap a ledger size printer/scanner (Epson WorkForce WF-7610) is these days. Very cool, man. And no, I haven’t gone hunting for the easter eggs yet, but now I will! LOVE these cleaned up & scrubbed scans, Dyson – they are going into immediate use at my tables, along with your Forbidden City geomorphs from the other posts. Inspired! Steve Sullivan – these are so stellar, true classics! I have found the Cthulhu temple & I’m excited to now find your signature in the west cliff path! What other Easter Egg goodies are there to discover? Tell all…!